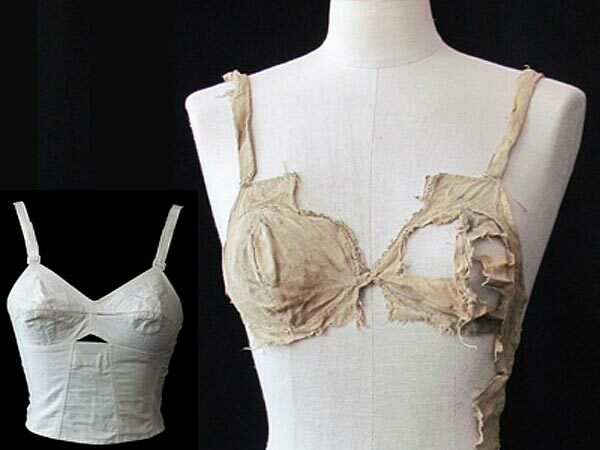 The most important undergarments for my 1870’s dress were the corset and bustle. Those are the items which give shape and form the silhouette. But they’re not everything that would’ve been worn. For that, a chemise and drawers are also necessary. And a corset-cover and additional petticoat also wouldn’t hurt. 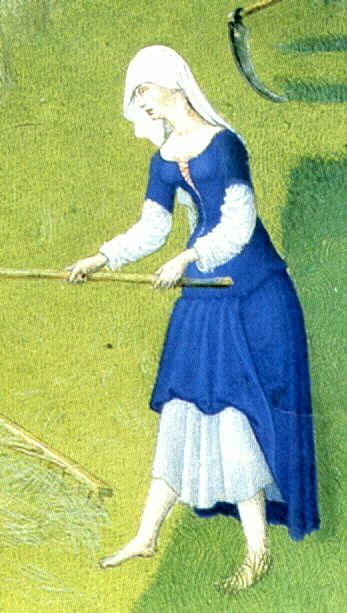 As a chemise is a very good project to start with historical costuming, I figured a full write-up of how I made mine might be useful. 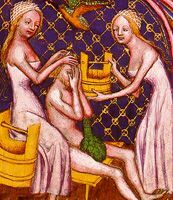 A slight side-note, I don’t know if this method is 100% historically correct. It is pretty much the same as is advised in the TV Edwardian chemise pattern though. If you’re less interested in the process, scroll down to the bottom for the finished product. The first thing I did was adapting the pattern. I only used the pattern for the general shape. Front and back are the same, so that’s already easy. I then pulled a simple shift-dress from my closet and used this to trace the dimensions. Where the strap would be, etc. 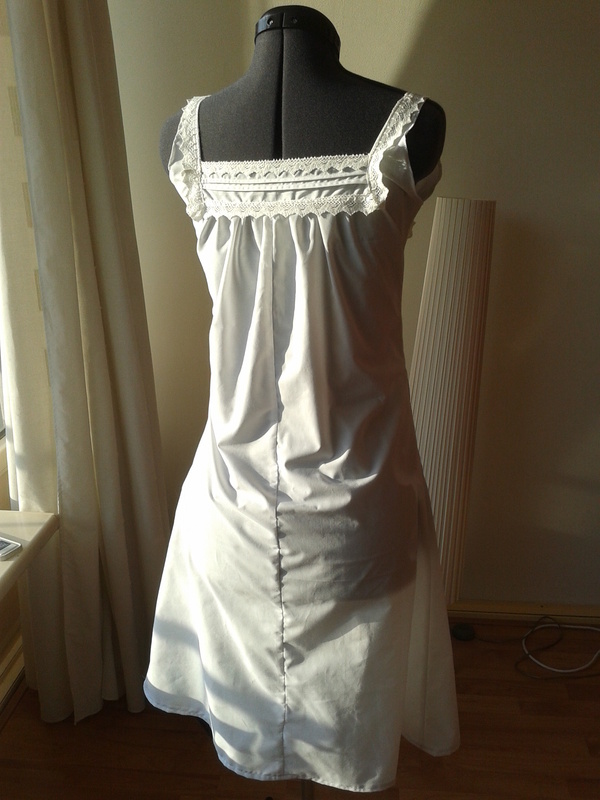 I added width for the neckline as it would be gathered. From this pattern, I made a mock-up out of an old sheet. I pinned it together and gathered the top to check the fit. My mock-ups are generally ugly, but functional. This was just the top, to save fabric. I only ended up shifting the straps to a slight tilt so they would lie a bit off-shoulder. I re-drew my full pattern on pattern paper first. Then I pinned it to my fabric on the fold. I cut out the pattern twice with room for the seam allowances. The ruler is for scale. I always trace my pattern in chalk if I don’t have a seam allowance, as here. The little part is the extended strap. I used French seams, which means you make the seam twice and catch the raw edges inside. It gives for a nice clean finish and a sturdy garment. To start, I pinned the two pieces together wrong sides together, as well as pinning the straps. This will mean the first seam will be on the outside, as is the goal with a French seam. Next up, sewing! You should sew a little away from your chalk line here. How far depends on how wide you want your seams. 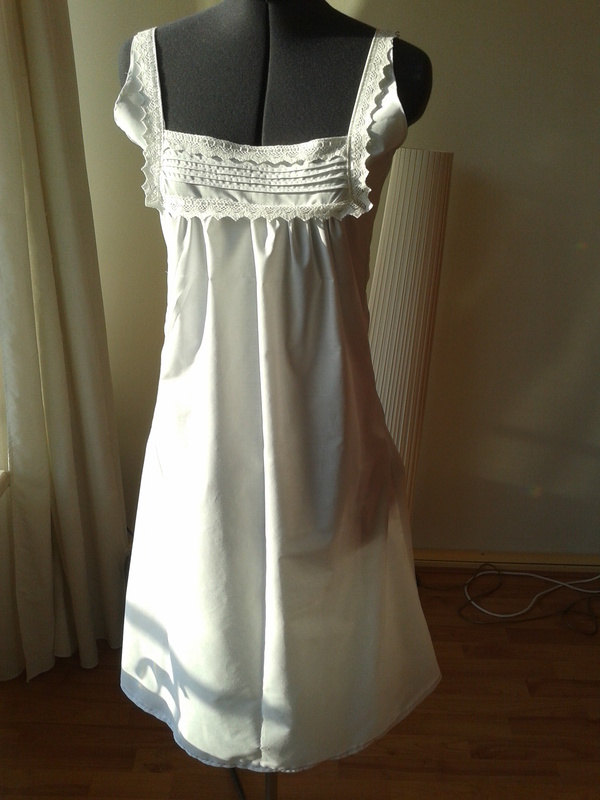 I was stupid and forgot this, and sewed on the line, but I’d advice 0,5 or 1 cm. The next step is ironing. So important for sewing! This is what the seam looks like before pressing. You press the seam open. Time to trim the seam allowances. They should be smaller than your seam width, or the distance you sewed away from your line initially. (As I stupidly sewed on my line, I cut them off to be very small). Turning the whole thing inside out, pin the seams again. I made sure my pins were just outside of where the raw edges were on the inside. And after. This time you can’t press the allowance open (as it’s caught inside). So I just pressed from the right side. I now trimmed the neckline and armhole to about 1 cm away from my chalk line. These will have a very narrow seam. I could’ve done this when initially cutting out, but didn’t decide on the narrow seam until this point, and I always rather cut too much fabric than too little. I used a zig-zag stitch around the armholes and neckline first to prevent fraying. And I sewed the hem around the neckline and edges! For the hem, I ironed the bottom over twice first. After pinning the hem in place for extra security, sewing time! This pattern works with a gathered neckline, so I made 2 rows of gathering stitches just below the neckline front and back. Pulling the thread, I gathered both pieces (front & back) to 23 cm. I decided I liked the look of the gathers as they were, so I left the tread in. To stop them from undoing, I made a knot in the threads of both stitches on every side. To secure the gathers, I went over them with a regular stitch, attempting to stitch in the middle of the gathering stitches. 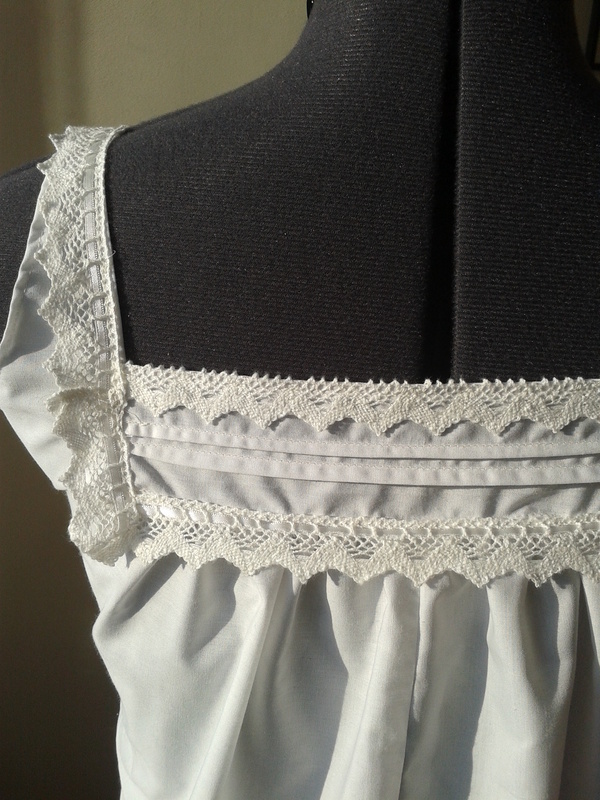 I had a little antique lace left-over from my Edwardian blouse, and it was just the right length to sew over the straps. I first pinned it on, folding over the raw edges on both sides. Almost done! 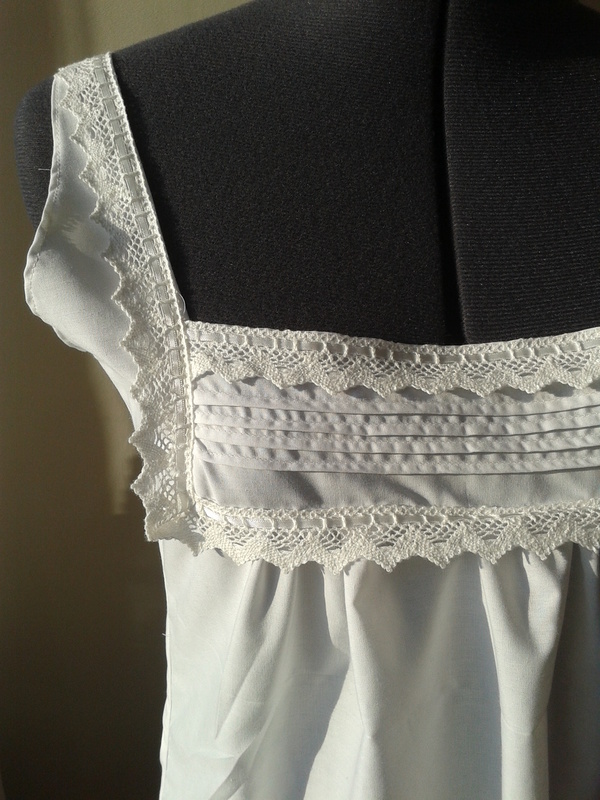 I debated extra lace along the neckline or hem, but I quite liked the way it looked now. I also didn’t have lace which really matched the antique, so I decided to leave it plain (very non-Victorian by the way). To finish off, I added little bows to mask the end of the lace on the straps. I had a productive weekend, and made 2 new (under) garments. One is a new petticoat for over my 1860’s hoop, the other an Edwardian shift. I started with the petticoat. My old one was quite heavy and seemed to do some weird things with my hoop dimensions, compressing it. As it was also not very period correct, being made of black polyester, I decided to make a new one. The new one isn’t quite as full, as I only had 3 meters of fabric, but it should do the job. It consists of 2 rectangles, the first gathered to the waistband and the second gathered to the first. I started with the first rectangle, and put it on my hoop to measure for length. I then drew a line along the 2nd full hoop (so not the half-circle ones). 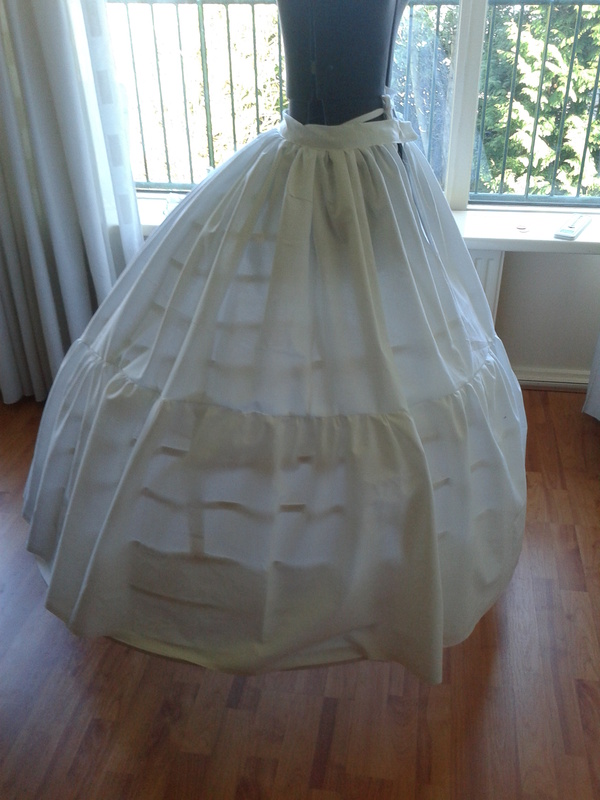 I sewed the bottom strip along this line, and actually ended up with a petticoat which is pretty even along the hem! It’s just a bit short, due to lack of fabric, but with a velvet over-skirt (which is quite heavy), that shouldn’t be a problem. 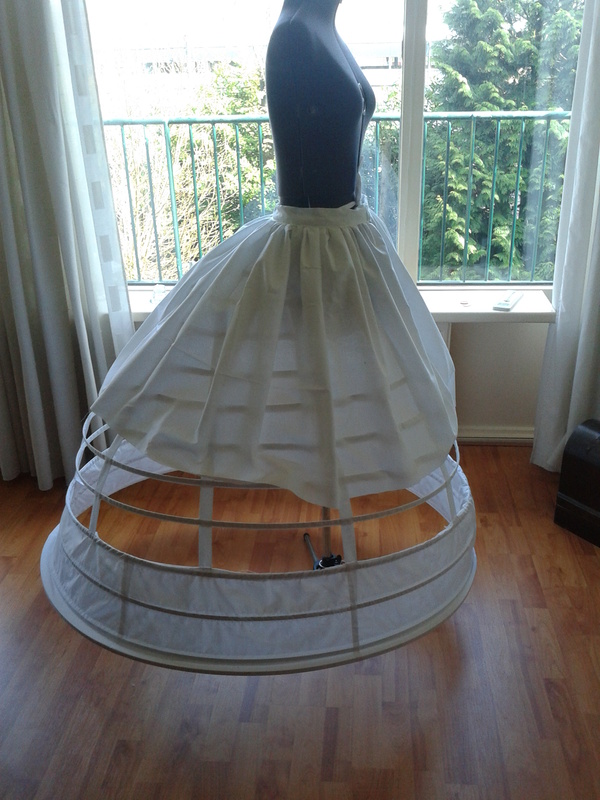 If I’ll ever make a new skirt for over this hoop with less volume, I might need to make another petticoat as well though. I ended up skipping the lace along the arm holes, and just made a small seam there. It has lace along the neckline, and 4 pin-tucks in the front and 2 in the back. I pieced the back, because I was using left-over fabric and couldn’t fit the whole thing without a seam. I quite like it, there’s just something about white cotton, lacy underwear.